Nothing! Everything you need is in the box! 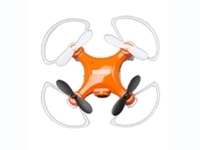 Anyone can fly, flip and capture photos and videos with the HobbyZone® Rezo™ quadcopter. Unlike other entry-level quads, the Rezo features innovative altitude hold, automatic takeoff and landing technologies, plus a built-camera that can record videos and take still photos. With the automatic flip mode, pilots can perform aerial 360° flips at the push of a button. Plus, the Rezo comes fully-assembled with everything needed to fly, including a microSD card and replacement propeller blades. It's perfectly suited for first-time pilots and just about anyone looking for a camera-equipped quadcopter for less than $35.